The Carpenter's Ministry Toolbox: CHRISTMAS: More Chrismon* Ornaments! I've posted on Chrismons before because I love the idea of a Christmas tree full of Christian symbols instead of just plain glass balls or cute ornaments. Check that post out here. I found some more great resources online that I thought I should share. Christian Ornaments - Some great Christian symbols and pictures of what they made. I love their templates!! Why Christmas - Some nice Christian symbols. 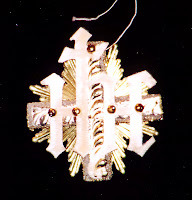 Christian Symbols Unlimited - A bunch of Christian symbols that can be purchased both painted or unpainted. If it's the first year you're adding Chrismons to the tree in your sanctuary why not have a little ceremony where the children get up and tell the congregation about each symbol? It's educational and celebratory!